Budgets are where the rubber of international commitment meets the road of government policy. Budget analysis allows advocates to enter complex debates concerning a country’s political economy and analyze budgetary decisions, beginning with country obligations under international and national law. Armed with budget data, human rights researchers can assess governments’ budgetary policies and provide alternatives. Yet, budget analysis is a vastly underutilized tool in human rights circles. As demand for numerical data on human rights continues to rise, practitioners should take budget analysis seriously as a method of confronting governments about their revenue, allocation and spending on human rights-related aspects of their budgets, particularly within the realm of economic and social rights (ESR). Governments often argue that they are unable to meet their obligations in terms of economic and social rights because they do not have the resources to do so. Yet, as recently articulated in the Addis Ababa Action Agenda issued by the United Nations, millions of dollars that governments could use to address socio-economic disparities are lost through illicit financial flows created through corrupt practices and tax evasion by wealthy individuals. Understanding how budgets operate and what governments prioritize is becoming more necessary to rebut these claims and hold governments accountable. Understanding how budgets operate and what governments prioritize is becoming more necessary to rebut these claims and hold governments accountable.Budget analysis is not new in the human rights field, of course. It is especially relevant to monitor ESR, which, in terms of the International Covenant on Economic and Social Rights, requires an assessment of whether a government has made attempts to progressively realize its ESR obligations over time, and within its maximum available resources. During 2000, Fundar Centro de Análisis e Investigación, in partnership with International Human Rights Internship Program and International Budget Project, gathered human rights activists and applied budget analysts in a series of meetings exploring the use of budget analysis to assess government compliance with its ESR obligations. The result was an in-depth budget analysis from an ESR perspective, Dignity Counts, which dissected Mexican healthcare spending prior to the country’s revolutionary 2002 reform. Today, others are involved in similar activities, including the International Budget Partnership (IBP), the Center for Economic and Social Rights (CESR), and the International Network for Economic, Social and Cultural Rights (ESCR-Net). Budget analysis work is conducted around the world and at all levels of government, by organizations located in both the Global North and South. 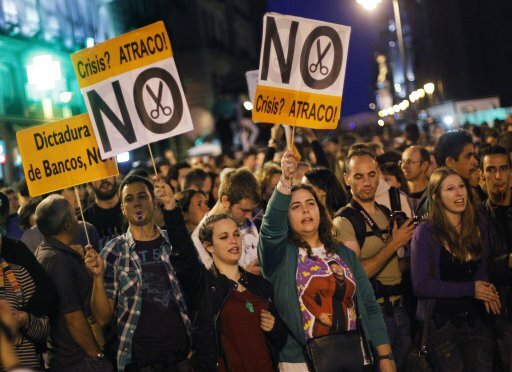 Protestors gather in Madrid, Spain to protest the government's austerity measures and handling of the economic crisis. Budget allocation analysis considers the budgetary characteristics of governments’ ESR commitments and obligations. Researchers compare spending patterns to see if governments are fulfilling their obligations. For example, budget allocation analysis can look at tradeoffs between national security and education spending; spending on government events, entertainment and advertising; disparate allocations to different groups; or per capita health allocations from one district to another. In the case of Spain during a period of austerity (2010-2014), budget analysis revealed that spending by the Spanish government on social spending dramatically decreased, particularly for those most vulnerable members of society. Budget expenditure analysis compares budget allocation to actual spending and is often the most important of the three types of budget analysis because it evaluates actual spending by governments. For example, in the original budget, a government may pledge 15% of its GDP to healthcare, but may only end up spending 10%. Returning to the case of Spain, during a period of economic crises and subsequent governmental austerity measures, the Center for Economic and Social Rights (CESR) was able to demonstrate that Spain has had one of the steepest drops in health spending relative to other European countries. This finding, alongside other analyses of Spain’s spending on ESR-related programs, was used to make specific recommendations during Spain’s Universal Periodic Review. From an ESR perspective, each of these types of budget analyses are informed by the legal obligations articulated in international law. Therefore, it is essential that state obligations to progressively realize to the maximum availability of their resources be transformed into measurable components. Turning these legal concepts into those measurable components is, however, an area of this work that experts seem to agree is in need of greater research and development. Transparency and data quality. Budgets are at times inaccessible or are populated with poor quality data—advocates can push for better transparency of state budgets that prioritize as a broader ESR advocacy strategy. Partnerships with budget organizations. Human rights practitioners should consider partnerships with budget organizations that are not specifically focused on human rights to aid in budget analysis from a technical standpoint. Also, partnering with local organizations that monitor ESR through the lens of budget analysis can add to the authenticity of findings, and contribute to soliciting the necessary action from politicians and lawmakers. Using budget analysis alongside other methods of monitoring ESR. Budget analysis is not an end in itself. Existing human rights methods that measure incremental steps of progressive realization remain relevant, particularly when there are missing data. These include an analysis of obligations contained in laws to measure policy efforts, and outcomes assessments, such as indicators and benchmarks. As governments transition to implement the United Nations Sustainable Development Goals 2030, human rights researchers and advocates invested in ESR should consider budget analysis as an essential tool to hold governments accountable to their own policies. Beyond advocating that governments recognize ESR as rights to which citizens are entitled, rather than mere outcomes of economic development, it will become necessary for human rights practitioners to understand the nuances of state budgets to ensure that the claims they make are pragmatic and capable of enforcement.